Hi there stampers, I am so sorry that I have been absent this last couple of weeks but family matters have been calling, and we all know that they simply must come first! My first card is from my sketch in week 40, and there was no additional challenge attached to it. My card base was Pretty in Pink and I then added a layer of Sahara Sand which I stamped in the same colour an image from Artistic Etchings. This was topped with a piece of Cherry Cobbler and a piece of First Edition DSP was attached. 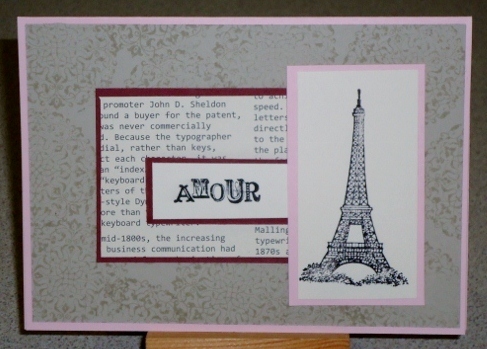 The sentiment was stamped using Basic Black as was the Tower on Whisper White, which was matted on Pretty In Pink. 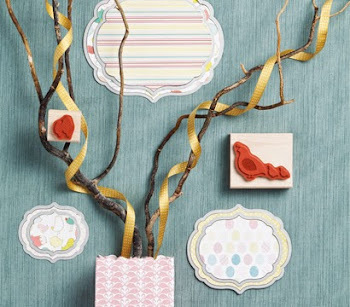 This was such a simple card to make and for all its simplicity I really really like the way it finished. Week 41 saw the sketch coming from our very talented Kris and the second part of the challenge was to use the In Colours from 2010 - 2012, which are retiring this year. I chose to use Pear Pizzazz, Peach Parfait and a touch of Concord Crush and Poppy Parade. First I rolled my Very Vintage wheel across the Whisper White base using Peach Parfait, I embossed a piece of Pear Pizzazz using the Textured Impressions embossing folder with the hearts. A piece of Peach Parfait Stitched ribbon was placed around the centre of that and I stamped the pile of cups from the set Morning Cup onto Whisper White then coloured it using my trusty Aqua Painter. The oval is the middle size oval on the Sizzix die and the edging around the oval is made from using the eyelet border punch and attaching it to the back of the stamped oval. This was then attached to the card front using dimensionals. 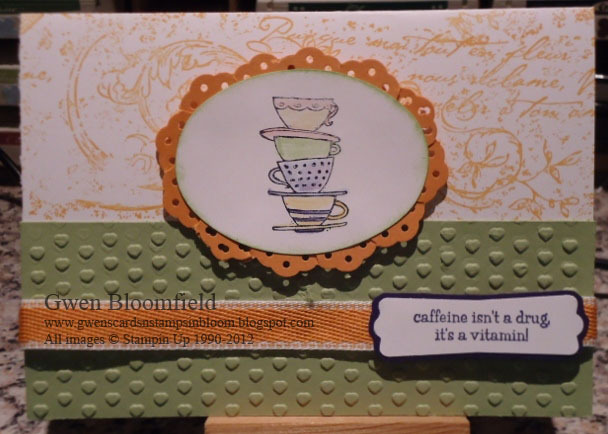 The sentiment too is from the Morning Cup set, and this I stamped in Concord Crush. I love the hearts embossed on the bottom and the use of the wheel at the top. The tea cups look adorable and I love the greeting.